My last post! i did it! I saw this on pinterest a few weeks ago and fell in love! One of the crazy 55 degree saturdays we had recently, Milo and I went exploring in the woods to see if we can find any stray bird feathers to make this project. We didn’t have any luck in the actual woods, but on our walk back to our house, I happened to look down and there were four bird feathers sticking out of someones lawn! I picked up dowel rods at michaels, and used embroidery floss that I already had. I’m still trying to think of a good way to display them. For now I found this vase at the thrift store for $2, so they are in there now, but its not quite right. I’m happy with the way these turned out, and they remind me of the little adventure milo and I took! Thanks to everyone who followed me and hopefully was inspired a little to make something new-ish every day. It doesn’t have to be much – much thanks to pinterest! Couldn’t have done this blog without it. Next year, i am definitely taking a break from a 365 project, but i definitely continue to make things – and will keep note of them here in this blog, so please continue to follow me. Thanks again and happy new year! 365. apple, orange, sweet potato and kale juice. Milo and I have been juicing alot these past few days we have been off! This has been one of our favorites as of late. this kid cant get enough! I got Vegan Eats World for christmas, and as excited as I am too cook from a new book, I’m also extremely overwhelmed by it. It calls for alot of ingredients I don’t normally have on hand, as well as take a little bit more elbow grease than my usual recipes. And alot of the things in there I have never even heard of – but thats not going to stop me! I decided I need to just pick a recipe and cook it. And tonight my cousin came over and we chose the pumpkin kibbeh. I never even heard of kibbeh, but we followed the directions and went to town. And it was good! It is two layers of pumpkin/bulgur/onion mixture, with an onion/walnut filling sandwiched between the two layers. It called for a cashew yogurt sauce that I didn’t make because I didn’t have any soy yogurt – we did some research later to find out what exactly is kibbeh, how do you say it, and how is it normally prepared. We learned that it is sometimes fried like falafel, which I can see, because all the bulgur reminded me of falafel. Which also made me think this would be good with something creamy – like hummus. AND we read that it is traditionally served with hummus! So i wasn’t too far off. This took a bit more time than I would usually spend on dinner, but it was a saturday, im on staycation and it was worth it. I also think this would be a great potluck dish! Oh, the recipe called for pumpkin, but I had butternut squash on hand, and that seemed to work just fine. have you ever had kibbeh before? what is it like? is this far from the real thing? 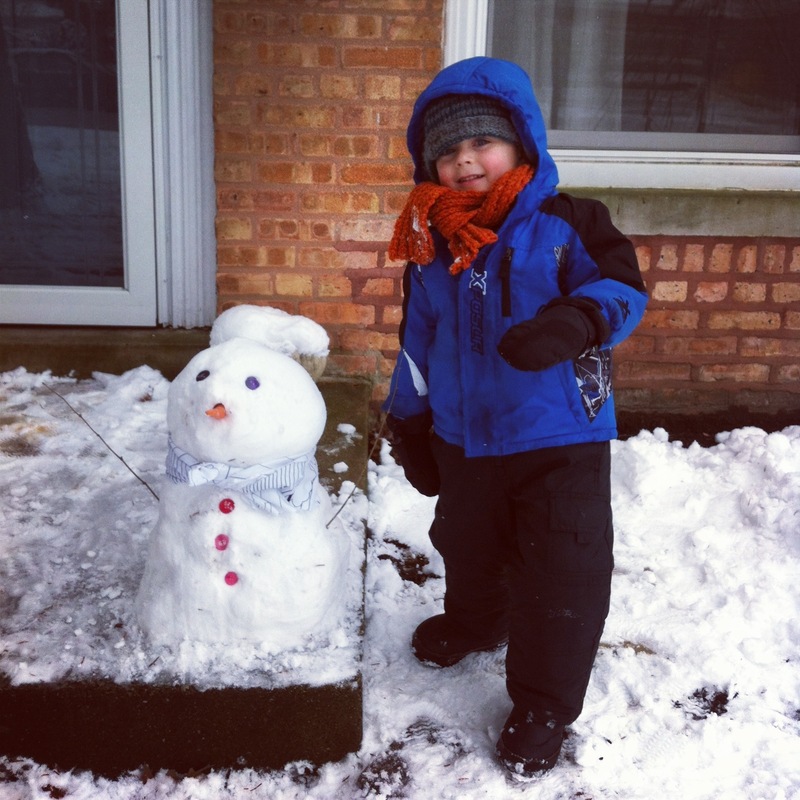 We celebrated our first real snowfall by making our first snowman ever! 362. double chocolate mint cookies. What to do when the holidays are over and you are left with candy canes? make cookies! I love chocolate and mint and the addition of the sweet minty candy cane on top is just right! and EEK! i can’t find where i pulled the recipe from because I just have a print out of it….So if i find it, i will definitely post it. For now, just drool over the deliciousness. 1. In a bowl, sift together the flour, baking soda, spices, and salt. Toss in the chopped crystallized ginger,breaking up any clumps with your finger tips. 2. In a large bowl, or the bowl of your stand mixer, cream together the earth balance and brown sugar. Pour in the molasses and beat well. 3. Mix in the dry ingredients until just combined (if necessary, remove the beaters and fold the dough with a rubber spatula instead, until all of the flour is just incorporated). The mixture should be thick and somewhat sticky. 5. Preheat oven to 325f.. Place balls of dough onto a parchment or silicone lined baking sheet, spacing them at least 1.5 inches apart. Bake on the middle rack for 10-12 minutes, or until the surface begins to crack – for a crispier cookie, bake a few minutes longer. Let the cookies cool 3-4 minutes before transferring to a wire rack. merry christmas! I dont usually make something THIS sweet for breakfast, but it was christmas morning! I thought milo would go crazy over these (which I think any other day he would – but these waffles were competing with PRESENTS this morning!). I had to serve them with a side of veggie bacon because I needed something salty to help balance all the sweet. Hoping to make some ice cream sundaes with the leftovers! Oh, and you can find this recipe in trusty ol’ veganomicon. I made some last minute christmas gifts for dj and my brother. I used this old descendents shirt I got from a clothing swap and turned it into pillows! Since I was crunched for time, I didn’t use a zipper, I just sewed the bottom shut, so its not as pretty as a normal pillow, but I used fun stripey fabric on the back, so maybe that will make up for it. Milo even helped me stuff them! Milo and I made these clay ornaments using a recipe I found on pinterest. We rolled out the dough, cut them out using cookie cutters, and then baked them and let them dry. We painted them, used sharpies and glittered them. We had alot of fun doing it, and are giving some as christmas gifts. In a medium sized pot combine the cornstarch, baking soda, and water. Stir this mixture over medium-low heat. You are going to stir this mixture until it is smooth and no longer feels stuck to the bottom of the pot. Stir constantly, after a couple of minutes, the mixture will begin to thicken. When it looks like smooth, thick mashed potatoes, remove the pot from the heat. Spoon the ball of dough into a bowl. Cover it with a damp cloth until it’s cool. When the clay has cooled, knead it on a smooth surface dusted with cornstarch. To avoid cracking you need to make sure the clay is well kneaded before rolling. Knead in a little more cornstarch if it feels sticky. Store the clay in a sealed bowl or bag. It will keep for a couple of weeks in the fridge. Bring it to room temperature before you use it. Line the baking sheet with waxed paper if you want to let them dry naturally. Turn them every day to avoid curling. This just takes longer than drying them in a low temperature oven. Preheat oven to 175 degrees F. Line baking sheet with parchment paper. Roll out clay to 1/4 inch thick on a surface lightly dusted with cornstarch. Use cookie cutters to cut out shapes. Transfer shapes to the prepared baking sheet. Use a straw to poke a hole in the center top of each decoration Place them in the oven for about an hour, turning them over halfway through cooking. As soon as I saw this recipe on shutterbean I KNEW I had to have some. Tracy actually sent me some to my door because I was drooling so much. This is one of my most favorite granola recipes ever! So I knew it would make great christmas gifts for my family! I put it mason jars and tried my best to decorate them kind of cute. Hope they like it! Here’s my version of it! Preheat oven to 300F. In a large bowl, mix the oats, pistachios, coconut, maple syrup oil, brown sugar, salt, cinnamon, cardamom together until well combined. Spread the granola mixture onto a very large baking sheet in an even layer. Bake for about 40-45 minutes, making sure to stir the granola every 10 minutes. The granola is done when the mixture is golden brown. Add the chopped apricots and toss well. Store in air-tight container.